Jack London, the acclaimed author of White Fang and The Call of the Wild, carried a love of adventure and a sense of purpose throughout his lifetime. His intrepid personality endures through his famous credo, which was immortalized in a 1916 issue of the San Francisco Bulletin. Encourage your students to live life to the fullest with this poster celebrating London’s philosophy. 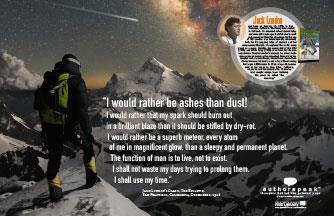 Download a free copy of this poster featuring Jack London’s powerful credo. More new puzzles, posters, eBooks, and lesson plans are being added to the library all the time. Sign up below, and we’ll e-mail you as soon as a new resource is added.